In anticipation of a long weekend away, I set to make my first vegan sundaes — a modified version of the grilled plum sundaes from Vegetarian Times! I didn’t quite get there. A lack of planning for the vacation, among other plan hiccups that sent my head into outer space meant that I only got halfway there. So I present to you — vegan ginger snaps. The first ingredient for these sundaes that are literally waiting to be made. 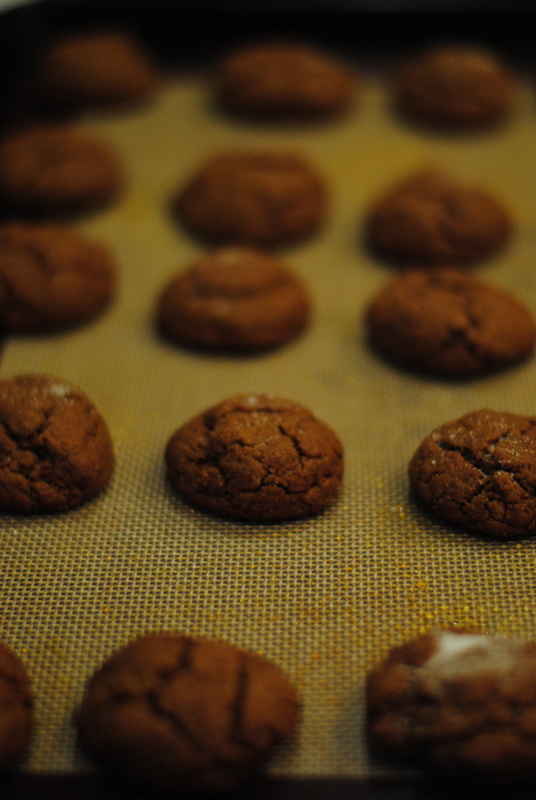 Because I veganized this, I had to make gingersnaps from scratch first, but, let me tell you — actually making these — EASY. (Though getting from step 1 to 2, from the freshly baked cookies to the compiled sundae, can be hard, it seems). Ginger snaps are pretty easy to make and if you already have a veganized kitchen, most of the ingredients are probably already in your kitchen. The only ingredients you might not keep stocked are molasses and ginger, but because molasses has a long shelf life (and is a good alternative sweetener) and ginger can go in just about any stir-fry, having them on hand makes pulling together quick, spur of the moment recipes off without agonizing at all. (I also love randomly making cookies, so there’s that). Preheat the oven to 375 degrees. And soften the Earth Balance in the microwave. Set aside. In a large mixing bowl, combine the dry ingredients: flour, sugar, ginger powder and crystalized ginger, cinnamon, salt, baking soda and baking powder. Mix well. 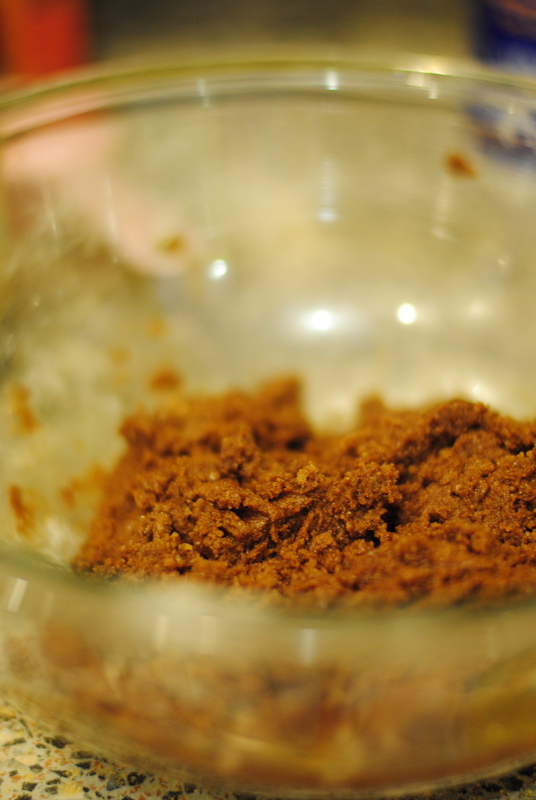 In a separate bowl, combine the melted Earth Balance, molasses, vanilla extract, and water. Combine the wet and dry ingredients and stir by hand well until all the ingredients are blended into a moist ball of dough. The dough will seem dry at first, but keep stirring and folding and it will come together. If needed add in extra water one spoonful at a time until the dough consistency is reached. Roll the dough into moist balls. Dip in a coating of sugar (this give the cookies their gourmet cracked top look). 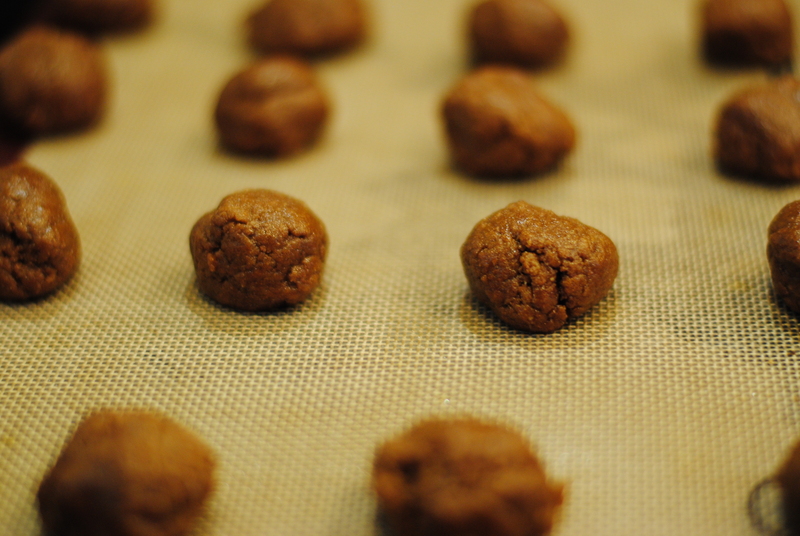 (Note: rolling the dough into balls produces thicker, more chewy ginger snaps, but I am sure it would work out if you rolled them thin to get more snap from your ginger snap!). Bake at 375 for 8-10 minutes. Cookies won’t be completely firm, but they will harden as they cool (allow at least 15 minutes on a rack). I got to the cookies. Compiled the recipes, veganized them, decided how to twist it up, make them in a hurry. And I succeeded. Packed them up to make the sundae elsewhere, ingredients meeting halfway. But then I forgot them. Twice. By the third attempt, time had run out. HOWEVER — the good thing about ginger snaps, well, ONE good thing — one among many — is that the longer you let them sit to wait to make the sundae — the more snap in the ginger snap. Crunch in sundaes, I predict, will make it all the more appealing. Variety of texture and flavor. Combinations go best when each ingredient holds its own. So — sundaes soon to follow! 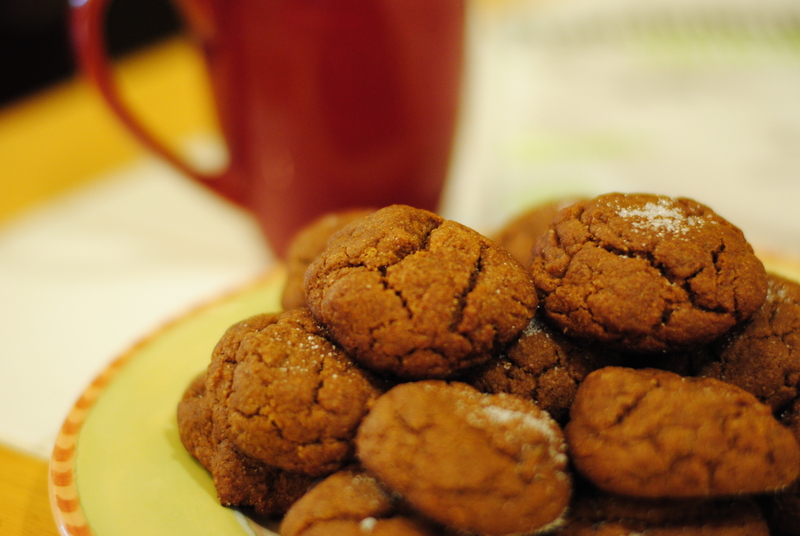 As for the Jewish history — ginger is not just a Christmas cookie. 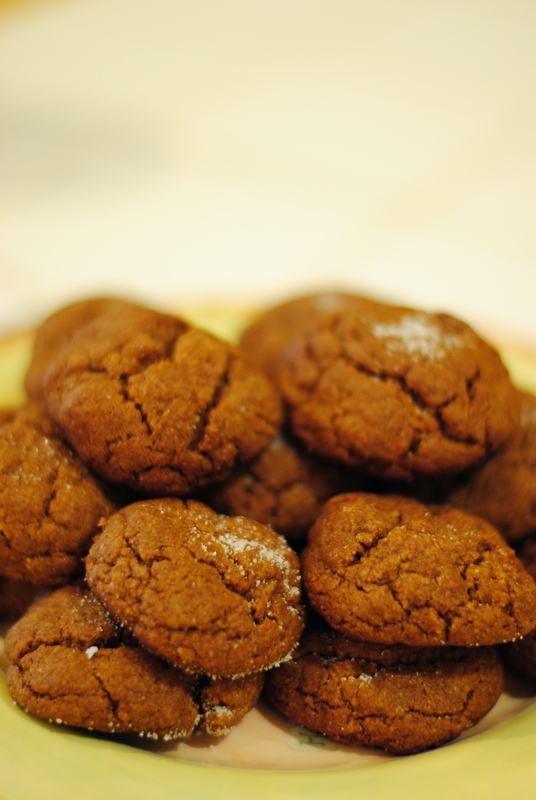 I think that usually when people think of ‘ginger snaps,’ they think of Christmas, but dig a little deeper and you embrace ginger for its true good — which is to say that ginger is awesome in basically everything. It’s almost an unconscious decision for me because I get so many headaches. My body just craves it. With that said, it’s not unknown around the world that ginger holds some amazing health benefits (which you can read about in more detail here). After the destruction of the Temple in 586 BCE, ginger was brought to Persia by traders and our ancestors in exile were there to learn of, and embrace, ginger’s medicinal power and great taste!